You're not stuck in anything unless you decide you are. All experience counts. I was advised to stay out of the OR from a retired ED nurse because he says that the work feels more collaborative in the ED and also that "surgeons are ****heads" LOL. I had a similar question, but you answered it here. Many programs have an RN to MSN program, but I think now I'll start with the BSN and then see how things go from there. There is actually a Doctor on youtube you said the opposite. He said medical school felt like "taking candy from a baby" because med school is pass/fail and he went into it when he was already in his 40's so he was serious and had more discipline than when he was in his 20's. He goes by "flightnurseMD". His story is very interesting. He was a nurse anesthetist drop out who became an anesthesiologist (MD). He also says that nurses eat their young and medical school was more supportive. I had my eyes on informatics and research BEFORE I applied to nursing school. I've only been a nurse four months now, and I don't have much experience, but I've been encouraged to go straight into my wanted specialty if I know that's what I want to do. 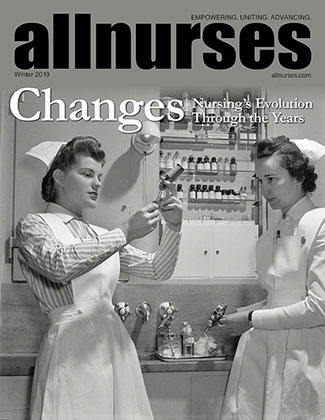 Do you believe that a new nurse needs to "pay dues" on the floor before pursuing informatics? BTW, I've had my eyes on Western Governor's program due to cost and NLN accreditation. What are your thoughts? I think these are things people need to figure out for themselves. What you are saying about nursing; I have heard MEDICAL DOCTORS say the same about the corporatization of medicine and how they are mules for insurance companies. Doctors now also work alot more for the same pay. You may see them go on vacation frequently, but many doctors leave the clinical setting because of burnout. This situation of stagnant wages is part of the why so many democrates are moving further left, and republicans moving further right. Wages are stagnant, FOR EVERYONE. We all have to be careful not to fall for the "grass is greener" syndrome. I know doctors who refuse to send their kids to medical school and the same with nurses, and the same with lawyers. In the words of Prince Nelson Rogers, "Everybody can't be on top." Life is hard unless you you come from wealth. That how it is, and how it will be. Study Materials used? Hours per day of study? Sorry to hear... How did you study for it and what was your strategy? What was your school's pass rate at the time of your graduation? How was your GPA in relation to your classmates? Is English your second language? Do you have anxiety problems? This is why I decided long ago, that if I want to move my practice forward I'm going to medical school. You're complaining about NPs, but I see the same thing with CRNAs. As a CRNA you have to take very similar classes to pre-med pre-requisites, you pay nearly 40k a year for 2-3 years, and when you're done you do receive the full payment from the insurance companies the way an MD does. Yes, you'll make 200k, but you're doing the same amount of work, going into the same amount of debt, for less money. You see, Medicare + Medicaid bills by points. A CRNA gets lets points, and the doctor gets more. Also, you'll still be subject to hearing crap from some hotshot 22-year-old doctor who doesn't know more than you. If you ask me, not worth it! Just go to medical school. Nurses really need to make sure they do their research before they spend money to go into these "advanced practice" programs. They are selling you something... and the opportunity costs might not be worth it. Also, attrition rates are much higher than medical school, and you know what nursing programs do???? THEY BRAG ABOUT IT!!! I used the Kaplan question trainers, and ATI as well as Saunders 5th edition. Overall, the Kaplan course was amazing and I scored in the low 60's on all my Q-trainers. I completed NO Q BANK QUESTIONS! The only knock I would give Kaplan is that their content material is lacking, this is why I used ATI and Saunders to remediate every question.